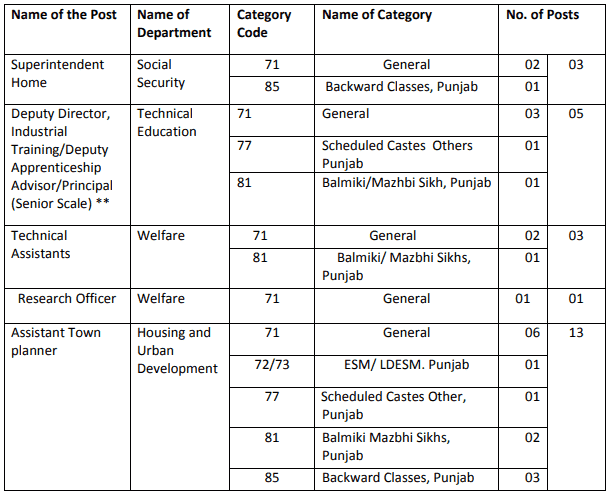 Punjab Public Service Commission has recently given notification of 25 Superintendent, Deputy Director, Technical Assistants, Research Officers, Assistant Town Planner Vacancies. You can send your applications for the Punjab Public Service Commission Recruitment 2019 on or before 15 March 2019. PSC Punjab Recruitment 2019-20 latest notification is out. As per the Notification, there are 25 Superintendent, Deputy Director, Technical Assistants, Research Officers, Assistant Town Planner Vacancies. The educational qualification is the Master’s Degree. The age limit is 18 to 37 years. If you are looking for Jobs in Punjab PSC then this article is going to be very helpful for you. Name of Department: Punjab Public Service Commission, Punjab. Last Date to Deposit Application Fees: 22 March 2019. The candidate should have a masters degree in the relevant subject. The age limit for is the 18 to 37 years as on 01.01.2019. ESM: up to 45 years. Widow/ Divorcee Women: up to 42 years. PWD: up to 10 years. The PPSC Vacancy is going to be on the basis of competitive examination. There will be a written examination of 300 marks (120 questions of 2.5 mark each) and an interview of 40 marks. The total allotted time will be 02 hours and 30 minutes for the examination. The pattern of the written exam comprises of 120 questions. You can pay the application fee through any branch of State Bank of India. After submitting the application form you can generate the application fee challan. You can apply for PPSC Recruitment online through the PPSC official website by filling the online application at www.ppsc.gov.in on or before the 15 March 2019. You can check the PPSC Result or Interview List from the official website.